What Makes the Ford Flex So Convenient? The Ford Flex is getting a well-deserved reputation for being one of the most convenient and comfortable SUVs on the market. It is packed with smart features to make your drive and operational tasks as easy as possible. While the Ford Flex already has a ton of cargo space, it allows for folding down of the rear seats for some additional room. You can also choose the power liftgate option so that you can easily get your cargo or groceries loaded in the back hands-free. The push-button start technology makes getting on the road quick and easy. Heated outside mirrors cut down on your prep time when driving in snowy weather. 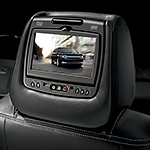 The Ford Flex also comes with Sync 3 technology so that you can use voice recognition to control many functions. If you want to find out why the Ford Flex is so convenient, test drive one at Mullinax Ford of Kissimmee.